For every successful arts and entertainment event, there is a lot that happens. From planning, venue bookings, selling of tickets to the actual execution of the event, so much happens in the background that mostly the fans know nothing about other than an assurance of a good time as well as value for their money. Months of sweat and pure hardwork go into planning before the gates open, fans flock in, artists step out onto the stage and execute a successful festival. Ever thought of the faces behind the well run and organised festivals? The unsung heroes who make the music miracles happen? Those wonderful magicians who make it possible for fans to enjoy world-class bands in magnificent surroundings year after year? Tamanda Mbendera, 32, is one of such. She has over the years proved to be a gem in this game such that she is the face behind one of Africa’s top music and cultural festivals, MTN Bushfire. With the Kingdom of eSwatini, formerly Swaziland, as the base, the annual festival takes place every May and brings together some of the big names in the music industry. In its 13th year, the feisty and soft spoken, simplistic lady fondly called Tammy in the local entertainment industry has overseen and successfully delivered three editions and is currently coordinating the fourth. “It has been amazing, daunting and exhausting, but I love my job. I think I am addicted to it. It has been a learning experience too, but it has put all of my previous skills to good use, so I am happy,” said Tammy. She is simply the boss calling all the shots from different angles, with an overall goal of delivering nothing but the best and managing a team of over 1 000 people. But how did Tammy find herself in this industry and how did she find herself calling the shots in a foreign land? “Bushfire is definitely one of the biggest festivals on the entire continent. An artist that I worked with at Lake of Stars [LoS] saw an advert for the vacancy online and called me to apply. The rest is history,” she explained. For some years, Tammy worked with several music and cultural events organisations in Malawi before heading to eSwatini. “This is my 10th year doing this, and I am excited! I got into festivals after volunteering at one festival where my favourite artist was performing. I have been in love with the industry since. “I have worked with LoS for over five years. I worked for City of Stars too. I was Qoncept Creative’s founding production manager and I have worked as a freelance event manager for corporate events. 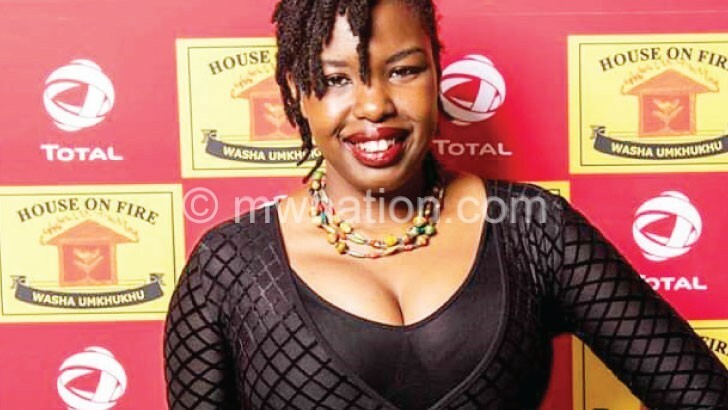 I have also worked for YouthFest at Blantyre Baptist as a volunteer production manager,” she said. Tammy said she has been in the arts for as long as she can remember, adding that her parents were art lovers. “My mum was a radio broadcaster; my father loved his literature and they both loved music. We sang all the time. It’s in my blood,” she said. Her mother, Catherine Mbendera, was the first Lhomwe news reader on MBC and a State House correspondent. She was also the host of Song Book Days, a programme about music from the 60s and 70s. In keeping up with the broadcasting spirit, Tammy worked for Capital Radio as presenter and producer between 2009 and 2011. She also had a short stint with PLFM in 2015. Through organising the Bushfire Festival, Tammy has learnt that the nature of events is the same everywhere. “Whether in Malawi or eSwatini, you are creating a space for human beings to have a good time in a suitable environment. It comes with risks. You basically have thousands of humans lives in your hands. “Not only do you have to think of keeping them entertained, you also are responsible for keeping them safe, secure and alive. We protect people while they have fun. That is our job,” she explained. For now, Tammy’s dream is to bring Malawian artists to the Bushfire Festival. However, this will not come on a silver platter. “I tell my fellow artists, they cannot expect to be on the line-up just because they know Tammy. On a global level, we must refine our craft to be competitive. Just to put things in perspective, I have been working for almost 17 years to get here,” she added. MultiChoice Malawi’s sales and marketing manager Chimwemwe Nyirenda has been to the festival and described the organisation and the people behind it as the best. “I attended the festival in 2017 and I was moved with the level of organisation involved. Every entry point or public place there was information about the festival, meaning the government fully recognises it and takes a leading role in promoting it. “There are no cases of congestion, time is of the essence and fans look forward to it every year. I only learnt later that Tammy was behind the huge success I witnessed,” he said.